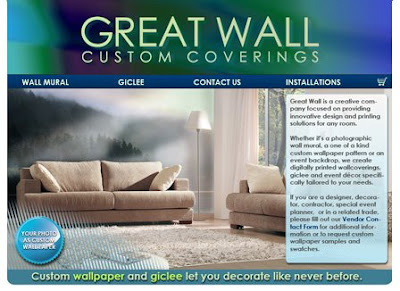 Here at Great Wall Custom Coverings, we toil day and night to bring you the absolute best custom wallpaper and wall murals available today, and we love what we do. However, sometimes you need to take a break and invest a little time back in yourself. That's exactly what we did with our website this week; we gave the homepage its very own day of beauty. We liked the old homepage, but it was time to freshen up. We still have the same information and imagery for custom wallpaper, but we've added a few new features. Namely, we've added links to our satellite interior decor and event decor websites. We've already blogged about our other interior decor sites, Wallgazer and Mosaic Tile Wallpaper. We're now featuring a link to our event decor site Bar Mitzvah Backdrops, we we specialize in printing large scenic backdrops for special events. With these changes in place, check back soon for more updates. We'll be featuring different custom wallpaper installation photos and blog entries that you may have missed, or certainly missed, or whichever! Plus, we'll be launching a few more satellite decor sites in the very near future as well. You'll be updated via our blog, but soon you'll be able to reach these sites from the Great Wall homepage as well. We hope you enjoy the new look and feel of our website!